A strong and mostly stoic character, Kenshirou is compelled to punish evil-doers and can perform feats not possible for most people. 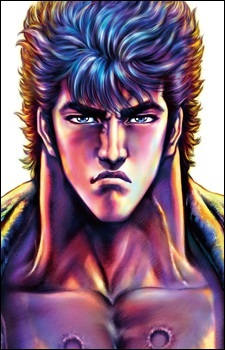 His mastery of the ancient martial art Hokuto Shinken allows him to kill or cripple with a mere touch. The results tend to be very messy -it usually causes parts of the victim to explode- but the art also includes several other means of killing. He can also use this art to heal or to alter people's behavior. Later in the series Kenshirou learns parts of other martial arts. His catchphrase is Omae wa mō shindeiru (おまえはもう死んでいる), meaning "You are already dead," which he usually says before a villain's head is about to explode. After surviving the nuclear war, he tries to live in peace with his fiancee Yuria, until Jagi instigates Shin, a jealous rival from the Nanto Seiken school, to challenge, then defeat Kenshirou. Shin then engraves the iconic seven scars on Kenshirou's chest and leaves him for dead. Prior to this event he was more forgiving of his enemies, as shown in a flashback of Jagi's failed assassination attempt against him, in which Kenshirou chooses to spare Jagi's life after defeating him rather than end it. When Kenshirou later fights his old rivals in the present, particularly Shin, Jagi, and Raoh, they all remark on Kenshirou's acquired mercilessness. The initial story arc centers around Kenshirou's quest to reclaim Yuria from Shin. In the very first chapter, he meets a pair of orphans who follows him in his journey: Bat, a thief; and Lin, a young girl rescued by Ken. Through the course of the series, Kenshirou protects the weak and innocent from the numerous gangs roaming the post-apocalyptic wasteland, eventually gaining his reputation as the "Savior of the Century's End." Kenshirou's skills improve through his encounters with members of the Nanto Roku Seiken and his Hokuto Brothers. Although still emotionally repressed and stoic like most male heroes in 1980's media, Kenshirou is notable in anime culture for being a sensitive and kind-hearted man who broke the then-ironclad "men don't cry" cultural expectation. He is famous for openly shedding tears, if not outright weeping for the suffering of innocents and the deaths of his few noble enemies. This trait is unfortunately downplayed in the 1980's anime adaptations, but comes back into the franchise in the adaptations of the 1990s and onward. In the 1970s, Kenshirou was born in Taiseiden, Land of Asura to the Hokuto Sōke family. Ryūken named Kenshirou after his older brother, Kenshirou Kasumi, because both had a Big Dipper-shaped birthmark on their heads. The identity of his parents has never been made clear, but he has an older brother named Hyō. Hyō and Kenshirou were caught in a fire and were rescued by Kaiō's Mother, at the cost of her life.